Working principles : Circuit board recycling equipment(wind-separated type) is applicable to recycle various waste printed circuit boards, PCB boards, FPC boards (those contain electronic elements shall be disassembled first). 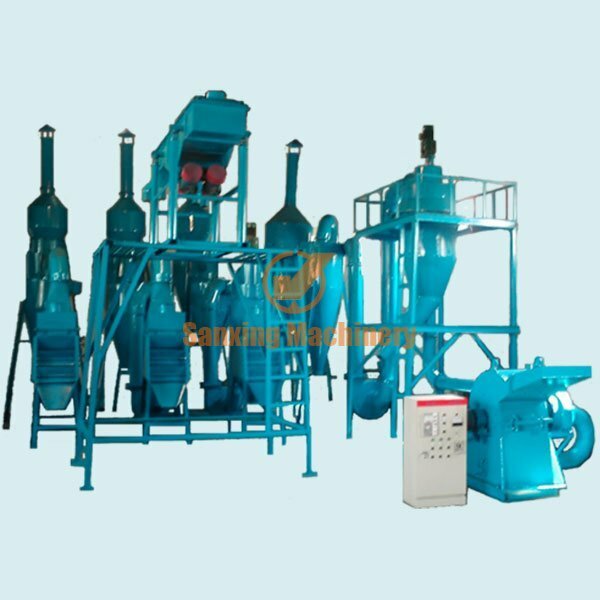 Operating principle: the mixture of metal and non-metal materials gained from crushing-pulverizing-classifying raw materials of printed circuit boards is fed into the material hopper of air separator, then into the separating zone of the separator. Since the separator is connected with a dust removal system, a horizontal air current is formed which moves the materials in horizontal direction. Meanwhile, with the action of the gravity, the materials move downward. Due to the different specific gravity of materials, non-metal materials such as fine dust and grains which bear smaller gravity are taken away by the dust removal system when the mixture passes the separating plate, leaving the metal materials with larger gravity into finished product recovery zone. Thus the separation of metal from non-metal materials is achieved.